The Exontrol's eXPivot tool is our approach to provide data summarization, as a pivot table. 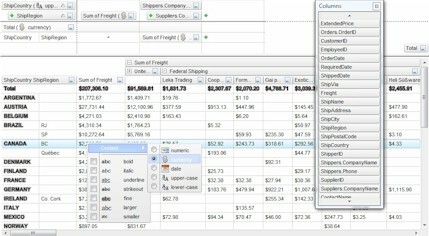 A pivot-table can automatically sort, count, total or give the average of the data stored in one table or spreadsheet. The user sets up and changes the summary's structure by dragging and dropping fields graphically. The eXPivot component lets the user changes its visual appearance using skins, each one providing an additional visual experience that enhances viewing pleasure. Skins are relatively easy to build and put on any part of the control.